​​“Growing up in the household of an expert garment maker,” Loraine Nemo says, “I learned the pleasure of playing with colorful fabric scraps at a young age.” By the time she was eight or nine, she was creatively sewing the scraps back together in a way all her own. Then when she learned of the formation of Riverwalk Quilters Guild twenty years ago, she quickly became a charter member.Her sewing room is a currently unclaimed bedroom waiting for the occasional return of offspring or guests. She has changed it into a cheerful and efficient workspace. Works in progress hang in pouches in the closet, waiting to meet the needle at a moment’s notice. For Loraine, fabric selection is always the best part of any project. Once she has her color palette selected, she is ready for English paper piecing or other paper foundation work to create her irresistible small projects. 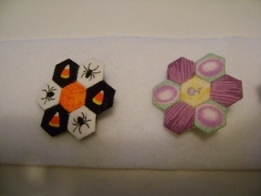 Her hand-worked ¼” hexagon pins are itty-bitty wonders. She also enjoys hand-piecing diminutive stuffed decorative balls and small hand and cosmetic bags. Ruching is a new decorative technique she’s currently using to adorn the bags with an elegant look. Of course, Loraine also enjoys machine work for her larger pieced quilts, especially the challenge of one-color projects. She likes to do free-form piecing. 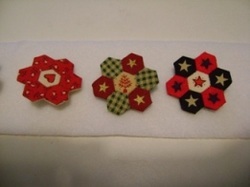 Many of her quilts go to charity, such as Quilts of Valor. She and her Material Girls Bee buddies make many quilts for charity. Pillowcases are also one of her favorite projects to complete on a regular basis to donate to the Guild’s philanthropy work. What other quilty things would she like to learn more about? She thinks heirloom quilting, curved piecing, and maybe more about art quilters’ techniques and ideas would all give her more challenges to consider. 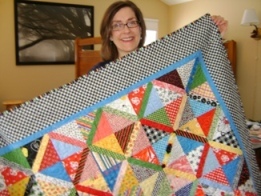 Riverwalk Quilters Guild has been the recipient of Loraine’s generous efforts. She has served as president twice, contracts twice; programs, and membership chair. In addition, she co-chaired the Guild’s 2007 Gathering with Carole Damske and the Naperville Quilts! 2013 show with Sandy Doubek. Her enthusiasm and affection for her many guild friends and activities is clear to anyone who chats with her for very long!